Prominent & Leading Manufacturer from Vadodara, we offer cooking liquid packaging spout pouches, liquid packaging spout pouches, brown paper spout pouches, spout pouches, medicine packaging spout pouches and oil packaging spout pouches. 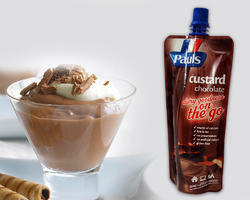 We are offering Cooking Liquid Packaging Spout Pouches to our clients. Swiss Pac Philippines produce stand up bags with a spout. that is one of the greatest solutions for liquid packaging because it is less expensive than other solutions like bottles and jars. 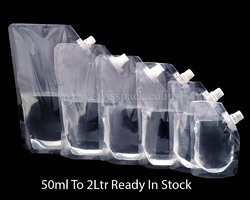 It is one of the types of straight bags, which gives it the same distinctive shape when placed on the shelves to attract shoppers, and this distinctive design makes the transfer easier And the more you can compare it with the glass, the transport car can carry 700,000 bags for 100,000 bottles. For the design of the bags with the faucet, you can choose between the pre-fabricated bags or bags printed with the design of your product. If you do not have a design or have an old design and want to change, Special for the bulldozer K design for doing the job, and can be used. 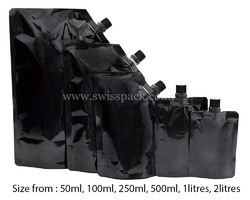 Bags with a tap in the packaging of many industries such as: packaging of juices and energy drinks, liquid soap packaging, oil packaging, pharmaceutical packaging. There are two types of bags with tap depending on the size of the tap you can choose between 10 mm or 22 mm Also you can choose where the addition of the tap in the side at a angle of 45% and filled the bag from a hole in the top of the bag or can be attached to the tap in the middle of the upper part of the bag and it can fill the bag from the tap. We use the rotogravure printing system and it is a suitable system to give the best print quality and supports 9 colours, which reflects a good image that helps in marketing your product. There is new revolution now in liquid packaging called Brown paper Spout Pouches. In past liquid was packed in rigid containers, plastic containers, glass bottles, plastic bottles. This entire product consumes huge plastic and it is very difficult to dispose of bottles and containers after usage due to this product is bulky in nature and requires more space to dispose. 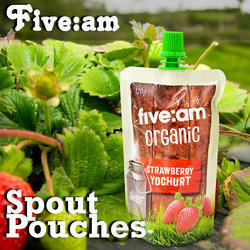 Now we introduce spout pouches. 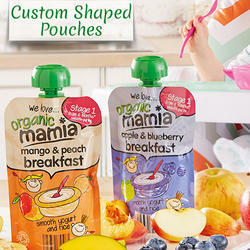 Our pouches consume less plastic so it is environmentally friendly packaging and they are recyclable. 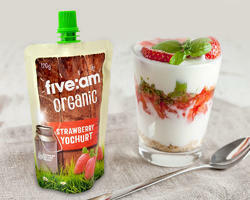 These Stock Spout Pouches are cheaper than bottles and containers and we can print 360 degree high graphical images. 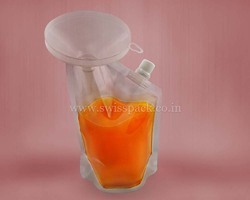 Transportation of spout pouches is very easy compared with bottles and containers. In one truck we can ship 700000 spout pouches compared with 100000 bottles. So we save fuel and environment. 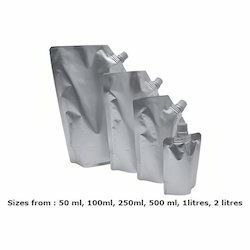 These pouches are really very easy to handle and requires less man power in production than bottles due to non bulky in nature. There is less breakage while transporting the filled product if filled in spout pouches than glass bottles or plastic bottles. So overall it saves lots of money. Ready to Drink Tea and Coffee Packaging and Many Others. There is new revolution now in liquid packaging called spout pouches. In past liquid was packed in rigid containers, plastic containers, glass bottles, plastic bottles. This entire product consumes huge plastic and it is very difficult to dispose bottles and containers after usage due to this product is bulky in nature and requires more space to dispose. We are offering Medicine Packaging Spout Pouches to our clients. 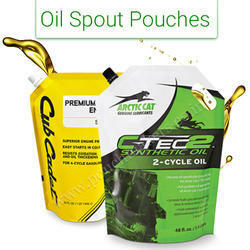 We are offering Oil packaging Spout Pouches to our clients. 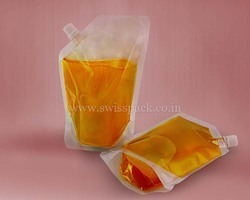 We are offering Cooking Oil packaging Spout Pouches to our clients. 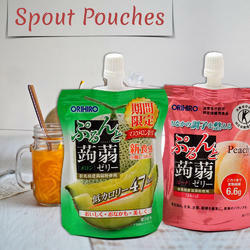 We are offering Fruit Juice Packaging Spout Pouches to our clients. 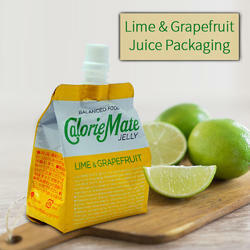 We are offering Lime and Grape fruit Juice Packaging to our clients. We are offering Honey Packaging Spout Pouches to our clients. 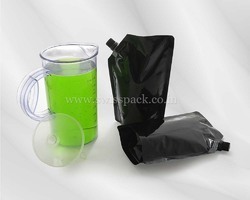 We are offering Liquid Medicine Packaging Spout Pouches to our clients. 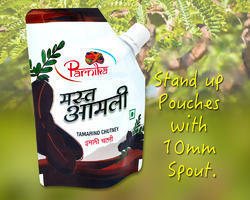 We are offering Choco Drink Pouches to our clients. We are offering Chutney Spout Pouches to our clients. 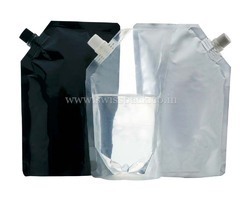 We are offering Custom Liquid Packaging Pouch to our clients. We are offering Custom Printed Spout Pouches to our clients. We are offering Custom Spout Pouches to our clients. 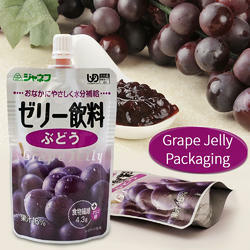 We are offering Grape Juice Packaging Pouch to our clients. 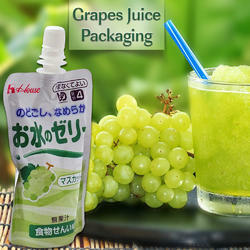 We are offering Green Grapes Juice Packaging to our clients. 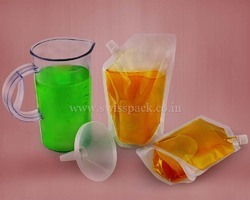 We are offering Juice Packaging Pouch to our clients. 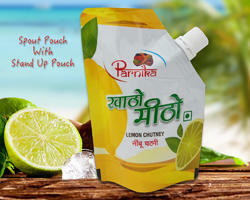 We are offering Lemon Chutney Pouches to our clients. 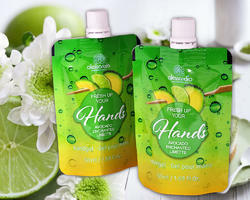 We are offering Lemon Juice Packaging Pouches to our clients. We are offering Paper Boat Spout Pouches to our clients. 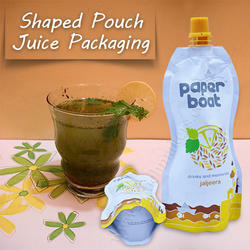 We are offering Shaped Spout Pouch to our clients. We are offering Spout Pouches to our clients. 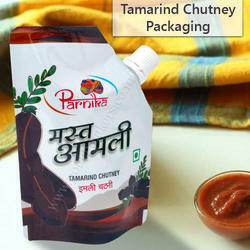 We are offering Tamarind Chutney Pouches to our clients. 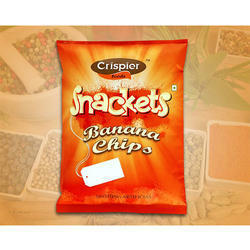 Pillow Pouches for Chips Snacks are the most frequently used pouch forms which is rather very simple but highly effective and is a cost effective and reliable packaging approach that provides an effortless storage and transportation process. Pillow bags are one of the most traditional ways of packaging used in the market; most of snacks that are in the market have been packed in such a pouch. When the bag is filled with product, it takes the form of pillow and hence its name is derived and is considered as pillow pouch. Its use is very popular in the market because of the low price of the bag. Pillow bags are personalized cheapest option that we offer. 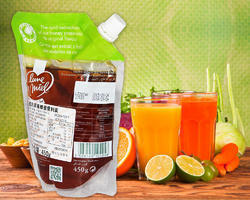 We are offering Juice Packing Spout Pouches to our clients. 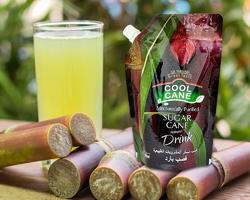 We are offering Cool Cane Spout Pouch to our clients. 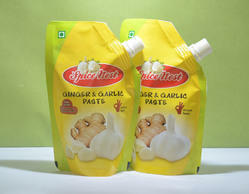 Custom Printed for Ginger & Garlic Paste Spout Pouches , Freshest paste of garlic and ground ginger in one hygienically sealed bag. 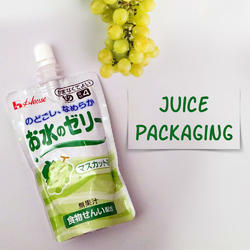 We are offering Juice Packaging Pouches to our clients. 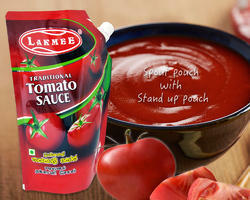 We are offering Lakmee Tomato sauce pouch to our clients. We are offering Lemon Juice Pouch Packaging to our clients. 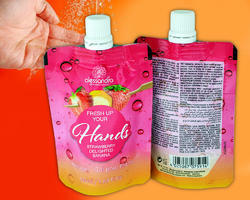 We are offering Liquid Packaging Pouches to our clients. 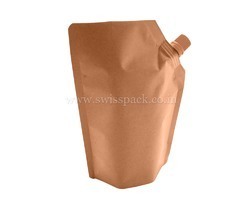 SwissPac India have digital print spouted pouches in different style of spouts, we also have spouted pouches in brown paper and we use biodegradable materials to make bags. Spout pouches are lightweight and portable. 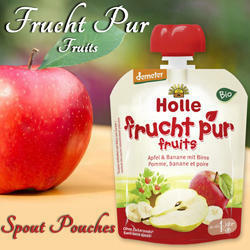 Spout pouches provide zero leakage and resistance from puncture. One of the biggest concerns of liquid products ‘manufacturers is safe delivery of their produce to retailers and then to consumers. Spout pouches are available in a various number of styles and sizes. They offer the aesthetics that very few packaging materials can offer.Spout pouches provide shelf impact that makes your products stand out from the range of rigid packaging currently on shelves, offering a competitive advantage. We are offering Curd Packaging Pouches to our clients. We are offering Engine Oil Spout Pouch to our clients. 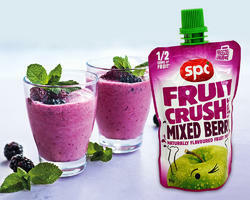 We are offering Fruity Crush Pouches to our clients. 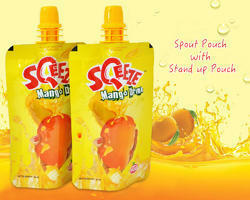 We are offering SQeeze mango Drink to our clients. 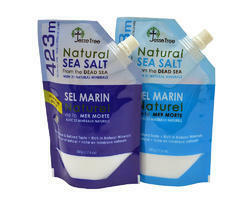 We are offering Salt Packaging Pouches to our clients. 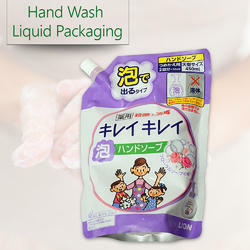 We are offering Hand Wash Liquid Packaging to our clients.